✨Amazement✨- that’s what Jake Miller brings to the world of education. Jake is a Technology Integration Coach from Kent, Ohio who loves creating tutorial videos and gifs for others to learn. He first tried out Flipgrid two years ago and has since been rocking Flipgrid in several meaningful ways. As a coach, Jake regularly shares innovative ways teachers can implement technology to support their goals, such as students providing meaningful feedback to one other. “VOICE” is the one word Jake uses to describe Flipgrid, and through his ideas, voices are truly magnified! 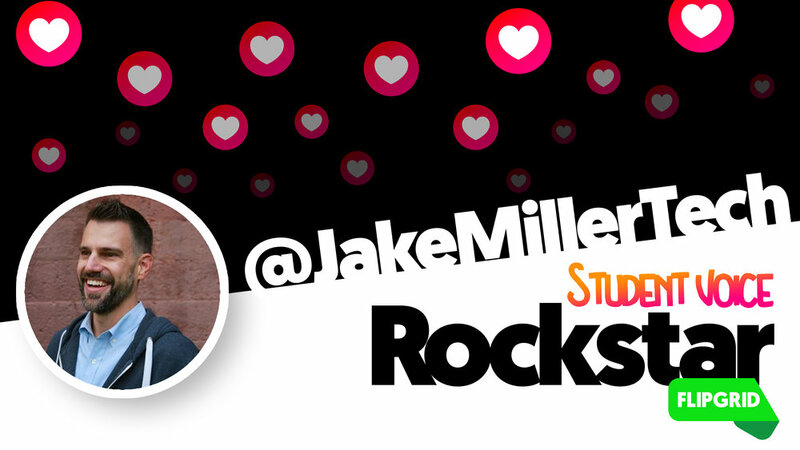 Thanks Jake for continuing to amplify the VOICE of ALL! Start with your content or learning goal in mind. The following is written by Educator Innovation Leads Jornea Erwin, Ann Kozma, and Jess Boyce. In the #GridTip Series, Jornea, Ann, and Jess share tips and tricks to help you explore ideas and possibilities with Flipgrid. Looking for more inspiration? Check out the Educator Innovation Station! The new year presents new opportunities to engage our learners and encourage them to share their voice! Here are 12 ways to ring in the new year with Flipgrid. Simply click any of the headings below to add a ready made topic to your own class grid! ☝️1️⃣💫#OneWord - Start a new tradition and have everyone choose one word that will be a guiding mindset for the year. Have students share why they choose that word, what it means to them, and how it will guide them. 🤩🏆🎉Celebrate Success - A win is a win, no matter how small! Students can share their epic wins or something they are proud of and highlight what contributed to their success. Celebrate those moments and their hard work! 🌍☮️♻️Learn the Global Goals - Use teachsdgs.org to share about the UN Sustainable Development Goals. Encourage students to get involved, make a plan, then share it with their peers! 🎮🎶🎨 Share Hobbies & Interests - Give students a platform to share the things they love and what makes them unique individuals! 🏡🗓🏫Information & Updates - Create a digital learning community for your school. Set up a Grid to share information and updates so that students and families never miss out on an upcoming event or important updates. 🤲💚🧠Teach Others - Let your students create something that will teach someone else! Give them the chance to share their learning with peers. Let everyone share their smarts, get creative, and have fun teaching others! 📝💡💭Reflections - Reflection is powerful in the learning process. Infuse reflections daily or weekly (#FlipgridFriday!) within your lesson for students to share their "lightbulb moments" for learning. 🚴‍♂️🏞🧘‍♀️Healthy Habits - Let your students explain the ways that they take care of themselves! Perhaps they love to bike, hike, or do yoga. Encourage your class to share tips for rest, relaxation, or rejuvenation! 😁🤓🤔2 Truths & a Lie - Have fun getting to know your community! Whether it is the start of a new school year or returning from a holiday, set up a Grid to play this fun and insightful game! You'll learn a lot about your students and share some laughs along the way. 🎓🎯🚀Resolutions & Goals - A new year is the perfect time to establish new goals. Ask your students what they want to work on or strive for this year? Provide the opportunity for them to establish a plan, put it in motion by sharing it with others, and then encourage them to go for it! 🗣❔🔮I Wish You Knew - Give your students the opportunity to share what they want you to know. Consider setting up a moderated Topic as a way to get to know your students better as well as providing them a safe space to share more about themselves. 👥🎟💬Connecting Classrooms - Take learning beyond your classroom walls and get connected globally! Share with #GridPals, extend the learning with collaborative projects, or contribute to a global learning Grid like Our Global Classroom. PS: For more ideas and inspiration, check out Building Community on the First Day of School by Student Voice Ambassador Kristin Merrill. 👋 Thank you so much for building a culture around amplifying student voice by spreading #FlipgridFever! We’re excited that you’re presenting Flipgrid and we've made it super easy for you to share your Flipgrid story! Feel free to adjust the order, remove slides, and insert your own content as you see fit. However you decide to present Flipgrid, the thing that will make your presentation most impactful is you! 🖥 Right-click to save any images from our website and download the Flipgrid logo here. 🦄 Engage your fellow educators in a #BetterTogether Professional Development Grid! 🚀 Explore the Educator Innovation Station to meet our Educator Innovation Leads (they can help as you plan your presentation!) and download shareable resources, Integration Docs, and #GridTips. 🔥 Search the hashtag #FlipgridFever on Twitter to find inspiration from educators around the world! 💥 Stay on top of all our latest product updates and community opportunities by bookmarking and sharing our Monthly Newsletter. 🤗 Follow us on Twitter, Instagram, and Facebook! If you haven't already, please let us know about your upcoming event at events@flipgrid.com so we can hook you up with some swag! Thank you for sharing Flipgrid. We’re so glad you’re part of this community! Jodie Deinhammer has fueled imagination, inspiration, and innovation through rockin’ out Flipgrid for almost 4 years! She is an amazing science educator, Flipgrid Certified Educator, and Student Voice Ambassador from Coppell, Texas. Jodie has engaged students from all over the world in discussing science topics within her incredible IMAGINE grid, which has generated over 2700 responses and the World Water Day grid with close to 1200 responses! We had a blast visiting Jodie and the students at Coppell Middle School East during the LoneStar 🤠🚌 #FlipgridBusTour! Jodie’s one word to describe Flipgrid is “POWERFUL” and we also believe her implementation of Flipgrid has been powerful in amplifying student ideas about science topics. Flipgrid allows my classroom to make connections with a global audience. When we work with other schools, students work becomes purposeful and relevant. Connect that with authentic projects that serve a real world purpose, and it gives you a great experience for the classroom. Use the Flipgrid Disco Library! There are so many great lessons in there that will connect you to other classes and give you ideas to make your classes more engaging. I would also recommend to check out the Explorer Series and the resources created for those. Engage your students in amazing topics created by Jodie, all found within the Flipgrid Disco Library. That’s it! Once you complete the first three requirements and submit your video, our team will review and activate your achievement. Your Flipgrid Certified Educator badge will light up on your Achievements page in your Educator Admin. If you have any questions, just email certified@flipgrid.com and we’ll respond ASAP!